"As a teacher and artist who has used Takach equipment for the past 16 years, I can say without reservation that your machines, equipment and service are exemplary. Phone calls are always met with courteous responses, intelligent suggestions and quick turn around." TAKACH PRESS STANDS BEHIND THIS WARRANTY 100%. DC Permanent magnet motor provides maximum performance. Motorized Drive Systems may be wired to meet international requirements. Pinch point safety guards are mounted on each side of the pressure drum and attached directly to the bearing support units. They move up and down with the pressure drum remaining a constant distance above the work placed on the press bed. If necessary, the guard will automatically shut down the motor drive, preventing injury. The drive system may be reactivated by simply pressing the restart button. Infinite bed speed control with constant torque from 0" to 4.25" per second. High speed return switch returns the bed to the inking position at maximum speed. All control switches are mounted conveniently on the operator's side of the press. Dynamic braking increases braking performance. An adjustable bed position limit switch allows the operator complete control of the bed travel length. 115 volts at 15 amps. No costly rewiring is needed. Common household current powers this system. The DC system is 50% quieter than conventional AC drive systems. The press bed may be operated at high speed in either direction. Press bed speed may be varied at any point during the printing cycle to maximize performance. Net result is increased production of prints. For information on our Pneumatically Operated Etching Presses, please Contact Takach Press. Three inch thick, staggered grain, hard rock maple wood is the core of our press bed. All wood sections are relief cut according to manufacturer's specifications to eliminate bed warp. Steel pins, 3/4" inch in diameter, connect bed sections. A .25" plate which has a phenolic-resin sheet bonded to the top surface, provides the working surface of the bed. The working surface will withstand all chemicals used in the printing process and will withstand very high pressures without embossment problems or loss of printing pressure. The underside of the bed is also covered with phenolic-resin to protect from moisture. 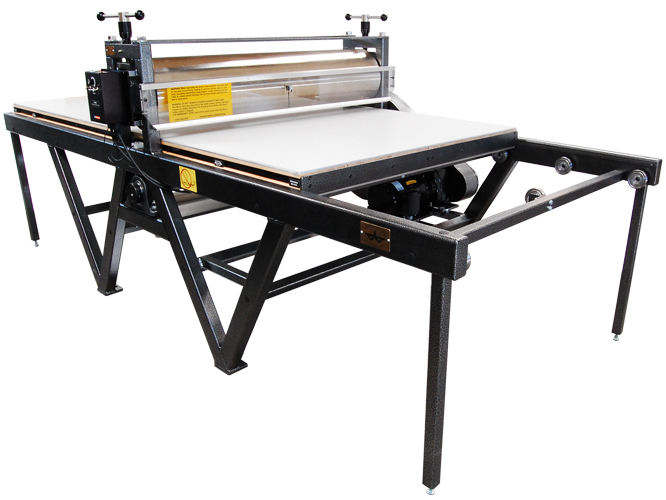 Uneven printing pressure is eliminated by independently adjustable precision ball bearings supporting the bed. Bed stops secure the moving press bed to the press frame. This feature is a must in today's safety conscious work environment. Nylatron wear strips attached to each side frame assure minimal bed friction. Powder coated chain guard protects operator from moving parts of drive system. All press parts are protected by nickel plating, anodizing or high durability powder coating. The powder coating is a custom metallic silver-vain. Custom color presses are available for an additional charge.